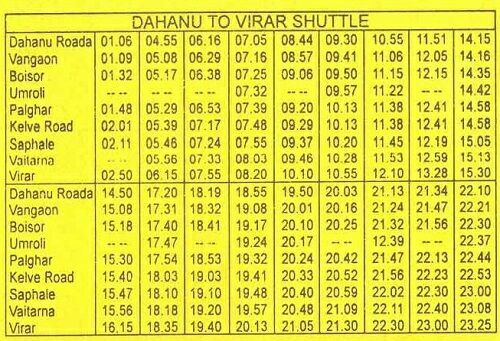 You can find the list of Dahanu to Virar trains here. Virar railway station is on the Western line of the Mumbai Suburban Railway network. Virar is a terminus station. It is around one and a half hours away by train from Churchgate and it is the first station on the Western Line. It is the only railway station that connects Mumbai to other northern stations like Saphale, Palghar, Dahanu and distant southern cities of Gujarat like Vapi, Surat, etc. An outpost of Mumbai, Virar is connected with the mainland by electric train since 1925. Virar is a very crowded area, among other adjacent stations like Vasai Road because it is a major tourist spot of Mumbai. For more information on tourist places around virar, visit Mahim Beach, Kelva Beach and Arnala beach. Here is the list of Trains from Dahanu road to Virar.